As a physical oceanographer, I'm used to thinking about the deep ocean. 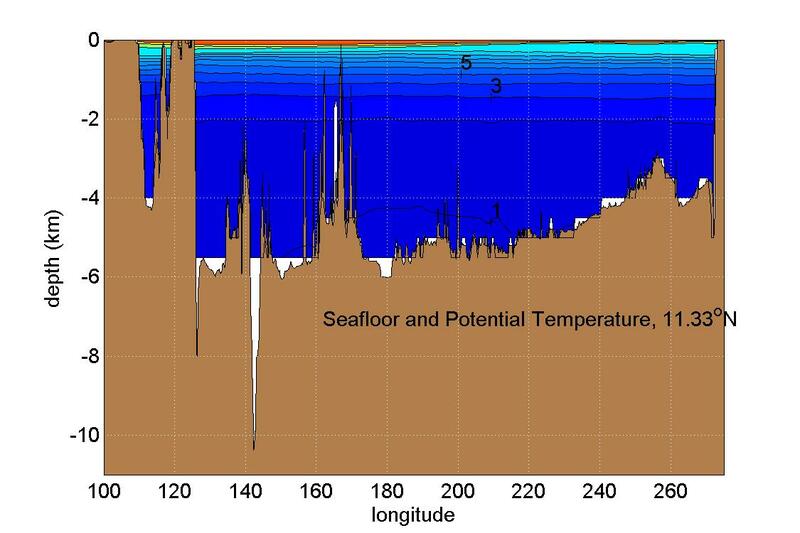 Figure 1 shows a side view of temperature distribution in the top kilometer of the Pacific Ocean at a latitude of about 11.33 degrees N and across the Pacific's entire width. Colors represent different temperatures, with numbers showing some values (Centigrade). Divers most often stick to the top few tens of meters of the ocean (the warm part shown in red at the top of the figure). However, there are interesting patterns of temperature reaching down hundreds of meters. Notice the sharp change in temperature at around 100-200 meters depth. Often a change in temperature marks a deep ocean current which can carry many times the amount of water of all the rivers of the Earth combined. While deep by human standards, depths that physical oceanographers are usually interested in are only a small fraction of the distance James Cameron travelled. Figure 2 expands the view to the entire depth of the ocean. Most of the ocean consists of a mass of water that is all just a little above freezing and which reaches down to five or six kilometers. Deep trenches like the Marianas Trench only occur in a few locations in the ocean but are about twice as deep as most of the sea. The Marianas Trench can be seen at about longitude 140 in the figure. FIGURE 1 Ocean temperature as a function of longitude and depth in part of the Pacific Ocean. 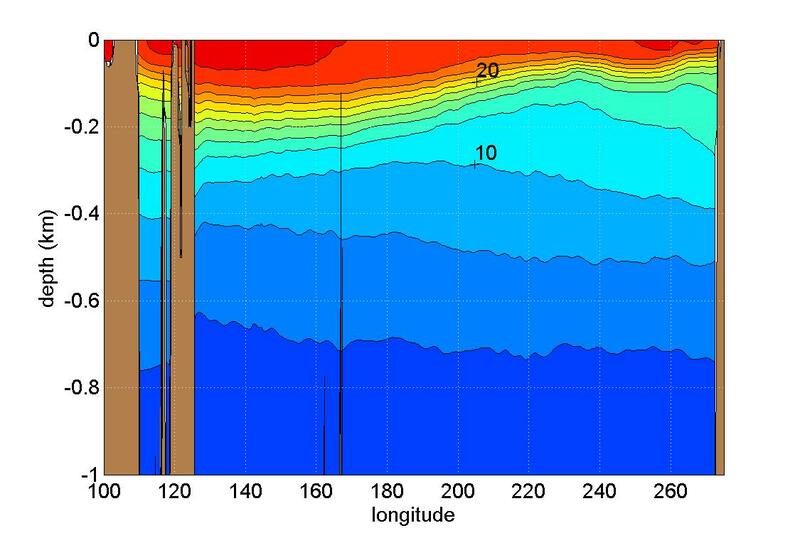 FIGURE 2 Pacific ocean temperature as a function of longitude and depth including ocean abyss. 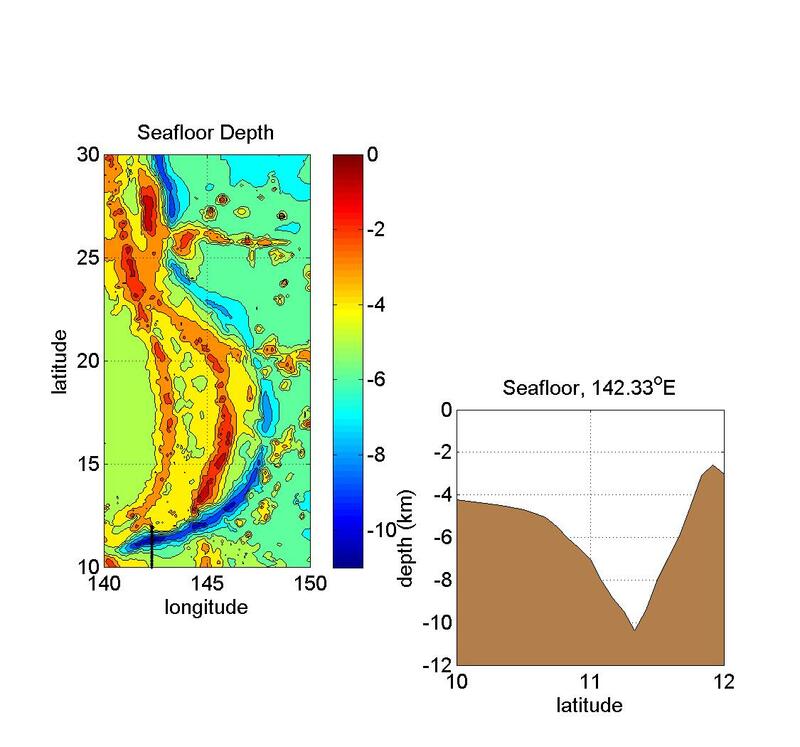 FIGURE 3 Marianas Trench bathymetry chart (left) and cross-section (right). Standard ocean atlases don't even include temperature measurements below 5500 meters. In fact it becomes difficult to lower an instrument down that far on a steel wire. Japanese scientists recently had a custom-made titanium wire made to lower a thermometer to make measurements (Kaira et al, 2005, Journal of Oceanography). Water in the trench has a similar temperature to that in the rest of the deep ocean. Deep sea trenches tend to be long and narrow and occur near island chains or continents. The left panel of Figure 3 shows a map of the Marianas Trench (blue) next to the shallow ridge that holds the Marianas Islands (red). A cross-section from south to north (black dots at bottom of map) reveals the V-shape of the trench (Figure 3 right panel). One thing to keep in mind is that side views of the ocean usually squash the horizontal direction much more than the vertical direction. From the figure above you might think the trench very steep, like standing at the south rim of the Grand Canyon, or the monster-filled trench in the Sponge Bob Squarepants movie. One degree of latitude is about 110 km, so the depth is much less than the width. For a more realistic view of the same cross section shown above, but with equal horizontal and vertical scale, see Figure 4. FIGURE 4 Marianas Trench cross-section with realistic aspect ratio. Temperature data is from World Ocean Atlas 2001. Sea floor data is from ETOPO5 -- not for navigational purposes, for any of you with your own sub! Any opinions on this web page? If you liked or disliked it or have any suggestions, drop me a line at bklinger@gmu.edu.